You don't think it's only laptop, tablet, and smartphone designers that go the extra mile to make their devices thinner and thinner do you? 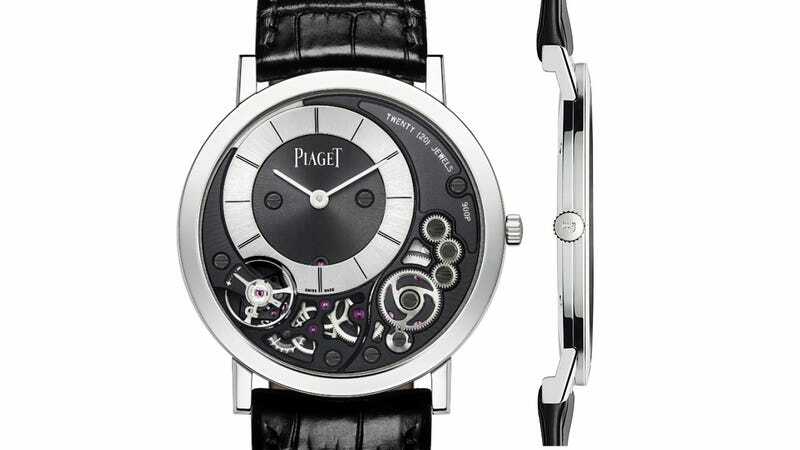 Watch makers are constantly battling each other for the same notoriety, and now Piaget has reclaimed the title of 'world's thinnest mechanical watch' with its new Altiplano 38mm 900P that measures in at 3.65mm—making it thinner than many digital alternatives. Snatching the title from Jaeger-LeCoultre, Piaget managed to shave a full 0.4mm off the thickness of the previous record holder. But the company's watchmakers did it in a very clever way. Normally a mechanical watch features a movement—all the gears and mechanisms that make it tick—inside a case. But with the Altiplano 38mm 900P, the movement is built right into the actual watch's body.